I, too, love the snow, but never would you catch my bare skin coming into contact with these frigid flakes. Bundle up your tootsies when going out in the cold and/or snow, please. Keeping your feet warm and cozy takes the proper attire to do so. Just wearing any ol’ socks and shoes isn’t good enough (but surely it’s better than going barefoot 🙂 ). If you are enjoying the beautiful snow (as well you should), be sure to cover your peds with socks made of synthetic fibers. Unlike natural fabrics, such as cotton, synthetic fibers will wick away moisture keeping your peddlers dry. And don’t layer up…one pair of socks will do the trick. Wearing multiple pairs will do much the same as what natural fibers will – cause your feet to sweat, therefore rendering them wet and cold. As far as shoes, your best bet is to go with a waterproof pair. Of course, not everyone owns a pair of waterproof shoes. In that case, just make sure you aren’t IN the snow for more than a few minutes. 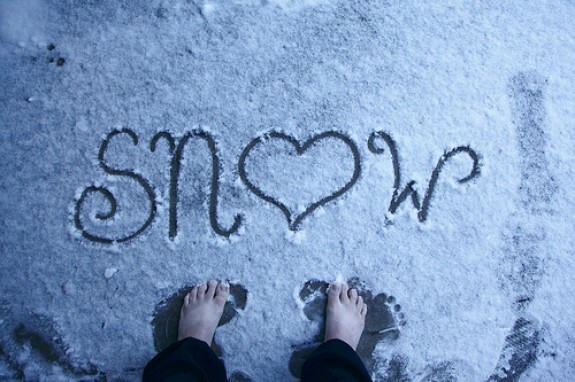 If your feet won’t be submurged in snow, you should be fine for a longer period of time. Stay warm…and on a completely unrelated note…GO BRONCOS!! !